Hopefully the only fire you'll ever see in your home is one you start in your fireplace. But sadly the fire statistics in the US remind us that we need to stay focused on fire safety tips to keep you, your family and your home enjoying the lifestyle you've worked so hard to achieve. There's a reason why smoke detectors are required in every home. And new homes must hard wire detectors so when one gets triggered by smoke, all the detectors in the house go off. If you're still not sure this problem is important, we've got statistics below to show you what's happening across the US. You might think you know and are following all the recommended fire safety guidelines. Maybe you are but trust me, I was amazed when I learned about a free and relatively easy way to enhance fire safety at home … watching this fire safety video on the Today show yesterday. It's easy once you get in the habit … so are you closing all bedroom doors at night? And don't be embarrassed if you said no because I haven't closed the bedroom door since our kids moved out. Learn why you always want to close bedroom doors at night … as it might save your life! 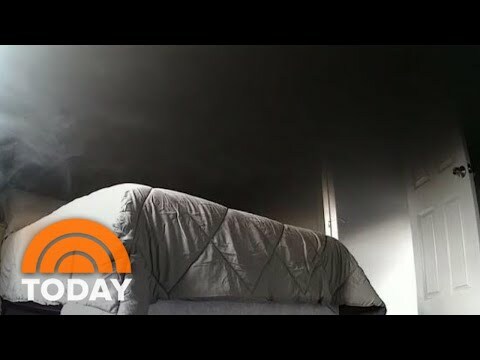 This video is a controlled experiment showing how smoke easily enters a bedroom where the door is left open. In contrast, the bedroom with a closed door suffers a lot less damage and gives the occupant more time to escape from the fire. Fire Safety Tips to Keep You Safe! In early October, you'll see a lot more information on this topic because it's National Fire Prevention Week (week where October 9th falls). There are lots of fire safety resources available and we've listed some of the best below. If you don't have a lot of time, here's a simple checklist that's worth reviewing with your family every fall. When cooking, stay in the kitchen if you're frying, grilling or broiling food. I burned a pan recently when I ignored this fire safety tip so now if I have to leave the kitchen, I set an alarm. Treat wood stoves and space heaters (fixed and portable) with care. Make sure you keep them at least three feet away from anything that can burn. Turn them off when you leave the room or go to sleep. Install smoke alarms on every level of your home. They should be installed inside bedrooms and outside (hallways) sleeping areas. New homes must have interconnected smoke alarms so if you're doing any remodeling, consider upgrading your system. The recommendation is you test your smoke alarms monthly so why not make it a project you can do with your kids, like teaching them good dental hygiene. Change batteries once a year and the smoke alarm if it's more than 10 years old. Close bedroom doors at night to delay smoke overtaking sleeping family members (watch the video above). Keep matches and lighters out of the reach of children. It's recommended you keep them in a cabinet with a child lock but my experience is with lighters kept near the outdoor grill. Inspect electrical cords (especially extension cords) and replace any that are damaged or have loose connections. This includes switches, outlets, cords, plugs and lighting equipment. Be careful when using candles and keep them one foot away from anything that can burn. Blow your candles out when you leave the room. Identify the escape window in each bedroom so everyone in the family knows how to leave if the door is blocked by fire. Write a home fire escape plan and practice it once a year. Order fire safety brochures (fee based) written for 6th graders to adults, from the National Fire Protection Association. Outreach materials and educational programs (free; some very nice videos for young children) from the US Fire Administration. Fire Loss in the United States During 2017 (published October 2018) covers more than your traditional home and car fires. You can also learn about the losses from wildfires across the US. Help! Fire Trucks Outside My House?